Each month at our downline meeting, we are given a challenge by Frenchie, our upline. For January we were given one of the notecards from the Watercolor Wonder Designer note cards package. I wasn't sure what I was going to do to my card, but went to my new favorite stamp set, Happy Watercolor. 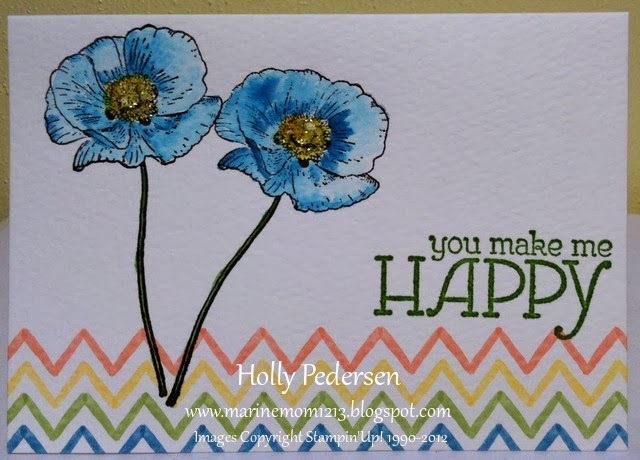 I stamped my flowers in stazon and then used my aqua pen to color the flowers with Island Indigo ink. I colored the centers with daffodil delight and added dazzling details to give it some sparkle. I love all that glitters! The greeting was stamped in Gumball Green.